An independent model has estimated that the coverage of fixed “superfast broadband” (24Mbps+) services across the United Kingdom has grown slightly from 94.7% in December 2017 (here) to 95.1% at the end of March 2018, with most of the increase being fuelled by publicly funded projects. The latest modelling has been produced by Thinkbroadband, which wisely tends to be a bit more pessimistic than official Government figures (both are estimates). 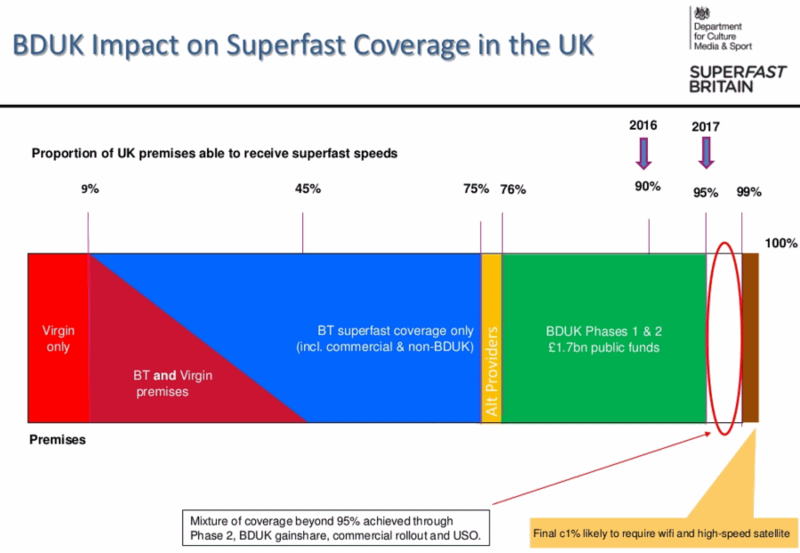 On top of that it’s important to remember that the first 76% of coverage was largely achieved by commercial roll-outs from Openreach (BT) and Virgin Media (plus a few alternative network ISPs), while much of the final 25-30% has benefited from £1.6bn+ of public funding via the Broadband Delivery UK programme (matched by contributions from private operators). Officially the Government aimed to extend “superfast broadband” to 95% of the UK by the end of 2017 and they just about delivered (here). The state aid fuelled BDUK programme has also indicated that a future combination of public funding reinvestment (i.e. clawback / gainshare from high take-up in earlier BDUK deployments) and new contracts could push UK coverage to 98% by around 2020 (here). The expectation is that this will leave up to around 2% of premises to suffer slower sub-24Mbps connections and those are expected to be catered for via the Government’s 10Mbps Universal Service Obligation (USO), which is currently still in the final design phase (details); after rejecting a voluntary solution from BT (here). Separately the Government has also committed another c.£600 million+ to support future “full fibre” (FTTP/H) and related “ultrafast” (100Mbps+) broadband deployments (here and here), although that is more about helping to foster the rollout of new alternative networks (altnets) than expanding coverage deeper into poorly served rural areas. Full fibre networks currently only reach 3.64% of the UK. Below you can see the latest data to the end of March (Q1 2018) and as usual we’ve stripped out some of the more confusing aspects in order to make it easier to understand. We’ve also left in the 10Mbps figure as this will be a useful gauge for understanding the ever shrinking scale of the proposed 10Mbps USO for broadband. Naturally we’re now seeing coverage growth slow significantly as the focus turns to the most rural / challenging areas, which will make it a slow crawl to reach 98% over the next couple of years. Due to this we may swap to biannual updates after the next quarterly report. NOTE 1: The term “fibre based” above includes fibre optic and hybrid fibre solutions, such as FTTP, FTTC / VDSL2 / G.fast and Cable (DOCSIS), albeit without any definition of speed (e.g. some FTTC lines will deliver speeds below 24Mbps). NOTE 2: Nearly all of the “ultrafast” (100Mbps+) coverage is coming from Virgin Media’s cable network, although Openreach, Hyperoptic, Gigaclear, Cityfibre, TrueSpeed and others all have big “full fibre” (FTTP/H) expansion ambitions for related services (here, here, here, here and here) and the rapid 330Mbps G.fast roll-out to 10 million UK premises by 2020 should also help. NOTE 3: Recent BDUK contracts have adopt the EU and Ofcom’s higher download speed target of 30Mbps+ for “superfast” connectivity, which on average tends to trail around 0.3-0.6% points behind the 24Mbps+ figure. NOTE 4: It’s very important to remember that Government / political targets like 95% or 98% reflect a national average, which can of course be better or worse for some areas (e.g. a few may achieve universal coverage, while others could be well below that level). 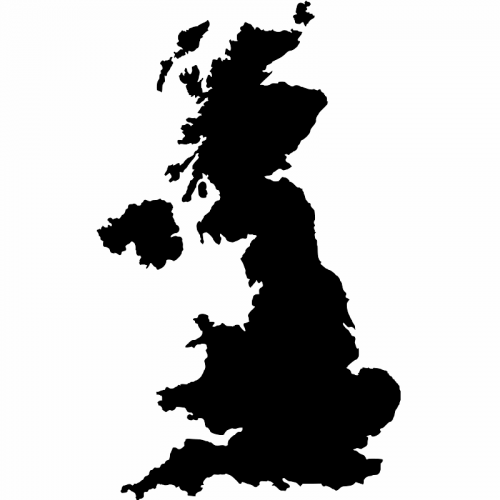 Take note that each devolved region has its own policy and targets, which all feed into the central UK target. For example, Wales aspires to reach nearly “every property” with 30Mbps+ broadband by 2020 (here) and Scotland hopes to do something similar by 2021 (here). The ‘Highlands and Islands‘ and ‘Rest of Scotland‘ areas above represent the two halves of Scotland’s overall roll-out programme. Elsewhere Northern Ireland, which has good “fibre based” coverage, remains one of the weaker entries and they’re clearly struggling to deliver speeds of 24Mbps+ to those within its reach. However a deal between the DUP and UK Government, which gifted £150 million to help N.I “provide ultra-fast broadband” to its population (here), may help to resolve that. As stated earlier, this data is only an estimate and should be taken with a pinch of salt, not least because it won’t always reflect the real-world (this is particularly true where issues like faulty lines, poor home wiring, slow WiFi, network congestion, street cabinets that are full to capacity and other problems can result in much slower speeds than expected). However it’s still one of the best gauges that we have for checking against official claims. The USO isn’t going to help those of us who have very slow broadband! I only get 3mb via FTTC and its caused by a length of ducted aluminum cable between the fibre cabinet and the DP, BT have no interest in replacing it, even at the DP which is 1km from the fibre cabinet its only 14Mb and although BT know they can solve this issue they just shrug their shoulders and walk away. Have you offered to pay for the upgrade yourself? Openreach management won’t even speak to me about it! Are there any alternative providers (e.g. wireless) you can turn to instead? Sadly no other providers, I am stuck with BT Openreach as my infrastructure provider. Aluminum cable is not fit for purpose as it does not perform like copper cable. FTTPoD might be your only option, though it will be quite expensive to install, unless you can share it with other neighbors along the same route. What are you saying? That you can’t get the “universal minimum speed” through your phone line?! That would mean, yes, that would mean, my oh my god! That would mean there is no such thing as a “universal minimum speed”! What are you saying here? You should just get the speed through the phone lines OMG! But if you are saying that you don’t and you know you won’t then where’s the “universal speed”!! BT don’t change telephone lines unless there’s a fault with voice calls. You could try satellite but it’s for people who “live up mountains”. Your best bet is mobile broadband. Provided you get a mobile signal, but it is very good. Why not use a dongle? Other broadband providers are available. USB mobile broadband is very good. BT aren’t very good. Try a mobile broadband. Nearly at the target … meanwhile Digital Scotland are still using a “Where and When” page that still carries a “BETA in testing” badge! Netherley, Aberdeenshires rollout has just been put back to Feb 2019, at this rate we’ll have 5G before we have fibre!!! I’m hoping that by the time fibre reaches us that FTTC is no longer the preferred option. Bring on the full fibre for those of us that have been kept waiting a decade more than the lucky ones! The USO is not much good to me either. Stuck on the end of a long line, nearest neighbour is 400M away with no wifi and no mobile signal. I think this is going to leave many very isolated with the only thing being on offer is a very expensive second rate inferior satellite system. Which I could have had 10 years ago! Being in the same boat I feel for you, the state aid that should have been spent on rural locations has simply been misspent on low hanging fruit rather than the harder to reach areas. I live less than a mile from Coventry city centre and can only get 1Mbps maximum with standard ADSL. The local cabinet is over capacity and I’ve been told that there are no plans for an upgrade. I have zero faith in these statistics. BT advertise super fast broadband to me and every single public database I can find says I am one of the majority who can get superfast broadband. Just because my local cabinet has been upgraded. However the reality is that I live too far from the cabinet to get useful infinity. I attempted the upgrade from ADSL but actually my speed halved down to 2 mbs. All the BT engineers I have spoken to admit this is an issue and have explained how VDSL degrades over long distances more quickly than ADSL, but still everyone advertises fibre to me. I have reverted to 4mbs ADSL. The Hampshire Broadband organisation were worse than useless in offering help, support or solutions. How will the USO help me? I am pretty sure it won’t. All these organisations are chocolate teapots. I think the only solution for me and the houses near me is to persuade the farmer to lay a fibre cable from us to the village to somewhere very near the cabinet. But where on earth do I start? 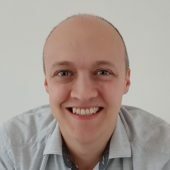 Have you actually tried your postcode in https://labs.thinkbroadband.com/local/postcode-search to see what it says and if wrong report an error. I’ve already been told by the foreman laying the fibre-optics in my village that I live too far off the road to have one. That’s ridiculous! But he is right. Fibre-optics don’t work off very well off road, they are very sensitive. So that won’t help people in the countryside. I’m not allowed to put a satellite dish on my old house (conservation area). So we just use a mobile broadband dongle on my laptop. I don’t have a compatible line for broadband, and they cost thousands of pounds to change. BT don’t change lines for free I’ve found. I use the “3” mobile broadband dongles. BT can’t provide me with a broadband service, so I use 3 instead. They are very good. On the outskirts of Bristol near the Mall and only on 1.8MB. Supposed to be getting FTTP but been waiting for over a year. What’s all this fuss over ‘universal broadband’ Don’t get fixed line broadband. Can’t get any through the phone line. Doesn’t bother me. Not compatible.